It's a beautiful transition of light and a crucial element in nature photography that allows the artist to capture a very distinct mood. The shades of color in the sky are intense, sometimes combining pastel reds and magenta with soothing blues. 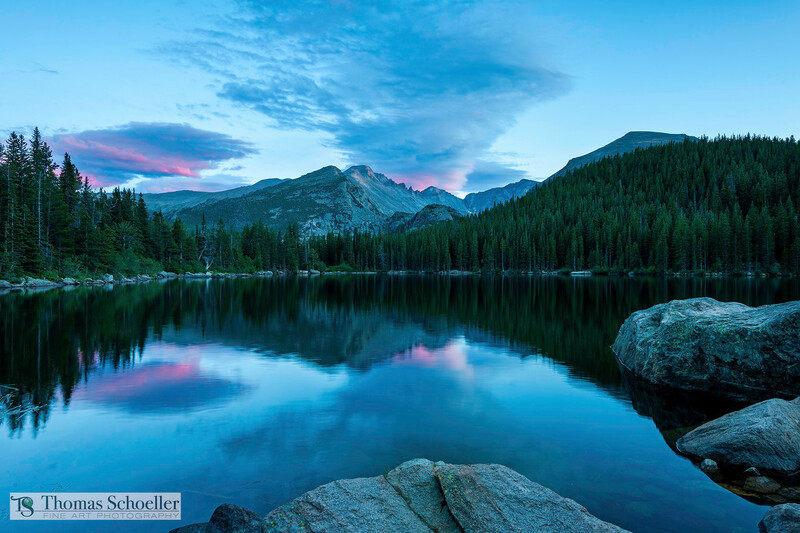 I captured this magical lighting event reflected in the peaceful and smooth waters of Bear Lake, Rocky Mountain National Park Colorado. The soft reddish tones illuminating from the bellies of the clouds is known as alpenglow. It's a stunning lighting phenomena that often accompanies the blue hour. Technically alpenglow is redirected sunlight, as it passes through the atmosphere at a very low angle it is stripped of all blue wavelengths and we are left with the warmer tones. The pointed mountain in the distance is Long's Peak, the highest summit in R.M.N.P. The highly detailed fine art prints will clearly allow you to see the rough serrated edge along the ridge line known as the Keyboards of The Wind.